Much like the flag that has represented South Africa since April 27th 1994 — the day the nation had its first racially-inclusive election, resulting in Nelson Mandela’s inauguration as South Africa’s first democratically-elected President — I at first considered my original logo concept for Mandela 100 something of an interim idea. Like the flag, my initial sketch unexpectedly became the final design. The call for a new South African flag was made just one week prior to election day, on April 20th, thrusting manufacturers into a panicked rush. Its introduction retired a design which had been in place since 1928. Vexillology nerd fact: that old flag was the only national flag in the world to contain a flag in a flag in a flag (a vertically-spread Dutch flag in a vertically-hung Orange Free State flag in the South African tricolor). With calls for the flag’s retention far outweighing suggested changes, it was made permanent on September 28th 1995. Thus, the green, black, white, yellow, red, and blue scheme was debuted — a set of colours I channeled in my logo for Mandela 100. I was in Monterrey, México visiting my girlfriend Kassie when African Women’s Forum in Portsmouth got in contact for logo/print/web work for their events celebrating the legacy and values of the revolutionary political leader on his birth centenary. 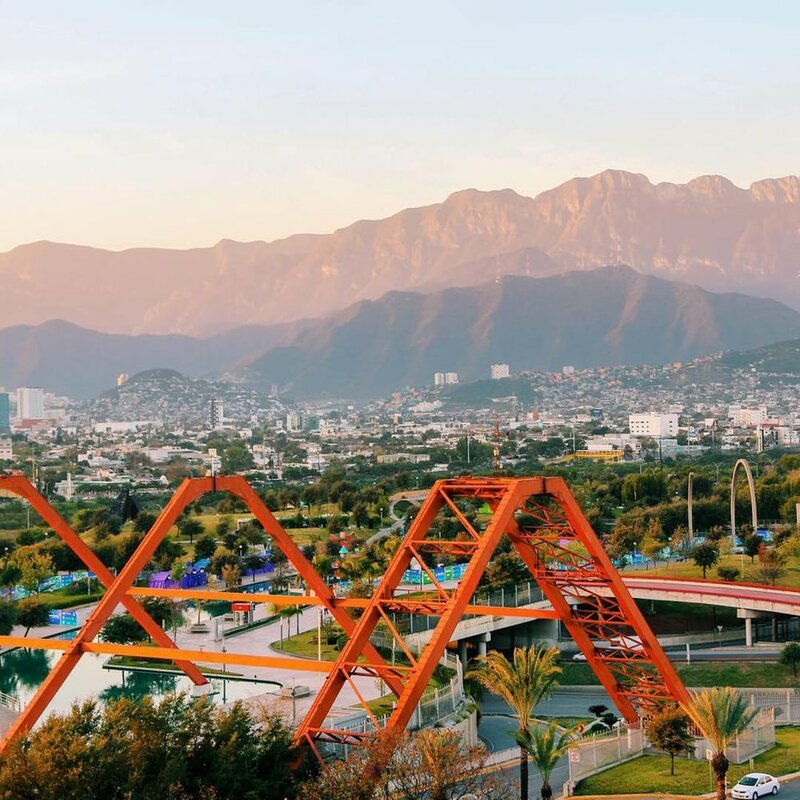 One of Monterrey’s most incredible features is Fundidora Park, a vast urban space built on the land of an insolvent steel foundry. It’s always heaving with joggers and cyclists. Pictured: Kassie at Fundidora’s sparkly entrance (skating! ), the view of another park entrance from my hotel room, and a cute silhouette sunset shot of some strangers. Fundidora Park regularly holds large festivals like Pa'l Norte. I had the Mandela 100 project in mind when I spotted a Pa'l Norte billboard from the back of an Uber, and the wild shapely type stuck in my head. I came back to the idea a couple of days later, throwing the sketch onto an Illustrator artboard and redrawing everything in a more refined and legible style. Looking up the South African flag in a couple of my vexillology books (like I said, flag nerd) led me to pouring a red/yellow/green fill across the respective hand-drawn letters. Somalia’s western horn formed a natural alcove for the ‘100’, the first hand-drawn version of which I quickly realized looked like the word ‘ZOO’. Too harshly sheared. A quick revision solved the problem. The southernmost countries and republics presented a challenge at first, as ‘MANDELA’ looked a lot better following a fairly consistent height, so there was a lot of empty space. As luck would have it, I had a tagline to incorporate into the logo — this otherwise-unpopulated region found its purpose. Having such lively wild typography bound within a neat orderly outline felt off, so I switched the outer stroke to a rough ink brush I bought off Creative Market a couple of years back for an album cover project and cut a grunge texture through the silhouetted continent. I get a lot of my grunge textures by taking photos of ageing street pavings or rusted walls and toying with various contrast and range selection tools in Photoshop, then outlining the whole thing in Illustrator. If you ever see me kneeling down on Southsea promenade snapping away at cracks in the ground with my phone, now you know what I’m doing. For the background, I uncovered some ‘Ankara’ textile patterns. The history of Ankara designs flirts with Dutch textiles of centuries passed, similar to how the old South African flag-within-a-flag-within-a-flag intertwined with Dutch influences. I mostly left the patterns untouched — I don’t feel like I’ve got nearly enough knowledge of the meanings of African textiles designs to respectfully create one from scratch — but I did make one small change: altering the mirroring in one place to create a heart along the mirror’s seams. Cute. A responsive website followed, closely mirroring the posters.